Express Wastewater specialises in providing a range of septic system options throughout Brisbane. Our team offer wastewater solutions for homes, businesses, and commercial properties, large and small. Because we specialise in septic tanks, systems, and sewage treatment our plumbers can offer expert advice and industry experience to help you decide on the best septic tank system for your needs. Finding the right solution for the sewage and wastewater from your property can be daunting. Our team offer a free no obligation consultation with one of our team to ensure you understand the requirements of your home or business and have all the options before you make a decision. 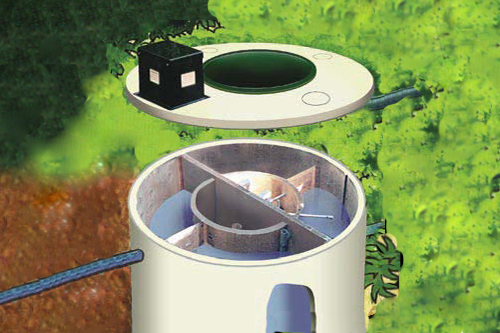 Express Wastewater supply and install energy efficient, environmentally friendly, long lasting aerobic wastewater treatment systems which are the modern equivalent of older style concrete septic tank systems. An important part of a septic tank and one of the main causes for future issues is the septic trench. Most plumbers still use the old slotted 90 mm pipe and that is what you will most likely be quoted on when you ask for a septic tank system. In some situations, these trenches work fine and will have a good long lifespan. However, in our experience, if they are not installed in the correct manner they can be a nightmare. The original savings recouped on installation can end up costing thousands to dig up and replace these smaller slotted trenches. Root intrusion – as you can imagine the effluent that is travelling through this slotted pipe is great food for roots, the slots in the pipe allow roots to quickly take hold. Because of the slots even if you clear the drain, they will just grow straight back. Crushed pipe – slotted 90mm pipe has a very thin wall and can be easily crushed from landscaping works, vehicles driving over the area, or even natural ground movement. Dirt and debris – once again due to the small diameter and slots in the pipe if dirt falls through it can quickly fill up and block the pipe. Once again once this process starts it is very hard to stop. Build up of septic waste – the calcification that occurs in a septic tank can also block up these type of trenches as it sits in the pipe and hardens. Our team, unless stated otherwise on a plan or the preference of a customer, will always install 450 mm jumbo trench. As we carry out septic tank trench repairs every week we can offer our services and the products needed often at a cheaper price than our competitors, even when they use the smaller, slotted pipe alternative. We can also take care of all septic repairs including septic tank pump repairs, filter replacements, broken pipes, bacteria replenishing, and problems with absorption pits. Protect the groundwater in your area and reduce contamination by keeping your septic system in top condition. For the very best in septic systems across Brisbane contact our wastewater team on 1300 770 594 or complete our quick online booking request today. We can offer advice over the phone or come out and inspect your property, septic system, or trenches to come up with the best plan to fix your septic tank problem properly. Express Wastewater service all of South East Queensland including Brisbane, Sunshine Coast, and the Gold Coast.